Box, instruction sheet, parts bag and decal sheet of the Italeri kit, which is a reissue of the Hawk/Testors model. 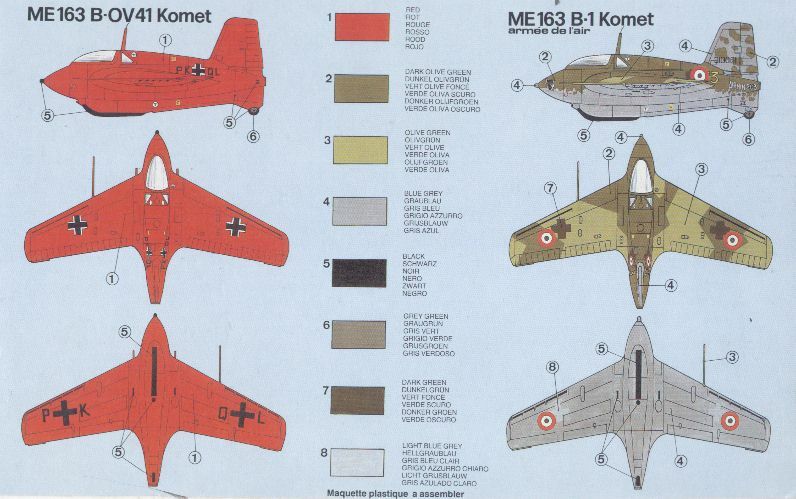 Decal options are the all-red PK+QL V-41 and a French captured aircraft (and possibly one more operational German aircraft). And a scan of the rear side of the box, showing painting instructions for two aircraft. The French captured aircraft is very interesting; I have yet to find a photo of the original. But its WNr (310061), code (yellow 13) and 'AIRMIN 203' markings appear quite convincing (courtesy Michel Jamin).